...McLaren is appealing the FIA's ruling that BMW and Williams broke the technical regulations, but aren't going to be penalized. Even better, McLaren is saying that they know they were beaten by Ferrari on-track, and accept that. They simply want to understand how cars can be found by FIA officials to have broken the rules and yet not have any punishment. A fair question, considering how the FIA has manhandled McLaren this season. As mentioned before, the FIA now has a serious problem on their hands, and it's one of their own making. I'm sorry this marvelous season has ended this way, but if it makes the FIA consistent in the way they enforce their own rulebook in the future, it'll be better for the sport. If the sport can survive this fiasco, that is. 1 I fully agree that the officials should be consistent. Whether that rule should be on the books or not, it is, and the rule was broken. As you said, given the way McLaren was treated this year, they have every right to be pissed about this business. 2 Alonso gone. And about time. News from Brazil is that both BMW and Williams are under investigation, post-race, for violating a technical regulation involving fuel temperatures. Article 6.5.5 of the Formula 1 Technical Regulations states that "no fuel on board the car may be more than 10 degrees centigrade below ambient temperature". This is to prevent teams from freezing their fuel and thus reducing its volume. Of course, that'd allow teams to get more fuel into the tank, providing themselves with an advantage. The ambient air temperature in Sao Paolo today was 37 degrees Celcius. Nick Heidfeld's fuel was measured at 24C and 25C at his two stops. Both Heidfeld and Robert Kubica, as well as Nico Rosberg, are now in danger of being excluded from the results of the Brazillian Grand Prix (that's a lot of Grand Prix!)... which would move Lewis Hamilton to FOURTH PLACE, giving him the Driver's Championship. UPDATE: The results stand. Nothing to see here. Except now the FIA is in a no-win situation. The tech regs have been violated. I'm interested in hearing why BMW and Williams won't be penalized, even if there was no performance advantage, if McLaren was hit with their death penalty for a violation of the rules that gave no performance advantage. One could argue that the FIA is playing fast and loose with their own rulebook, enforcing or not at their whim. Unless there were defective thermometers, why shouldn't the teams be penalized? If McLaren wanted to fight this, they probably could, and it seems to me that they stand a good chance to win some concessions at the very least. F1 is an unforgiving sport, and Hamilton blew it today. By all rights he shouldn't win because he didn't drive like a winner today. I want to see winners and losers chosen by the competition, not by the judges. And I don't like having someone (like Kimi) think he's won, only to have it taken away from him hours later. I understand why they have rules like that, but this one seems particularly picky and stupid. The critical factor in fuel is weight, not volume. And cooling fuel doesn't change how much it weighs. As much as I'd like to see Hamilton get the championship, things like this should be decided on the spot. To take it away from Kimi now would not be fair, nor would it be fair to give it to Hamilton when he is unable to celebrate. They might as well give Massa the Brazilian win while they're at it. 3 The critical factor in fuel is weight, not volume. And cooling fuel doesn't change how much it weighs. True, but it DOES affect how much fuel you can put into the tank, how fast you can get it in, and, apparantly, it gives a slight performance boost until it warms up (reportedly, about four laps). Whether or not it's enough of an advantage so to improve performance (I'd think the extra weight might balance out the boost) is another question. But having MORE fuel in the car for the same volume, that could make a difference. Having watched the race, I didn't particularly notice that the cars in question were operating out of the ordinary, so I'm guessing that the result of the race will stand. Fine. Then let everybody do it. Then it's not an unfair advantage. For the sport, today's decision is just about as bad as it can get. If there was a violation, which affected the season outcome, why wasn't the rule enforced? If the rule is not going to be enforced when it matters, why is it in the rulebook at all? This season is a shambles. I'm sure Kimi is glad to have won, but I'm equally sure he would rather have won it without the assistance of draconian and inconsistent judging. It turns out that there's a perfectly good reason for the FIA telling Lewis Hamilton that 'undue celebration' is banned: it's to prevent somebody slipping extra weight into his jumpsuit after the race. See, the car/driver combination (minus fuel) has to weigh 600kg (1322 lbs) or more at the end of the race. After the race is complete and the cars are placed in parc ferme, but before the podium ceremonies, each driver is weighed. Later, of course, the cars are weighed. It appears that, some time in the distant past, a driver was celebrating a victory by hugging every mechanic on his team. Whilst he was doing that, one of the mechanics slipped a weight of some amount into his driver's pocket... maybe not much, but the cars are so light that even 50 grams (or 1.7 ounces) might be enough to make weight. Indeed, drivers aren't even allowed to put on their watches until after weigh-in. The 'excessive celebration' rule is in place to prevent that sort of chicanery. Never mind that Slappy Schumacher used to practically bodysurf the Ferrari team after a win, and HWMNBN used to nearly molest Flavio Briatore after he was victorious, and who can forget Phil Massa's win and victory celebration at Brazil (his home race) last year? Never mind all that, now the FIA is going to crack down. Oh, you wanted to know about Quals? Well, click below and find out! 2 "Hello everyone... I'm from the FIA. Everyone needs to take a few steps back because I'm about to shoot myself in the foot and we don't want any evidence of impropriety while I perform said shooting...."
Lewis Hamilton has been told by the FIA (via McLaren) that if he wins the Driver's Championship on Sunday, he should "keep a lid on his victory celebrations." 1 That's stupid. That's really dumb. I can't think of any good reason for it. That's ridiculous!!! Whatsa matter? Can't the veterans take a rookie winning? I don't recall a Lewis Hamilton victory that was raucous or stupid -- like those animal poses Alonso does, for instance. Welcome to Interlagos, which means "between the lakes" in Brazillianese, and "Wonderduck hates this track" in English. Particularly the final turn-goes-into-the-front-straight thing that has the drivers cutting across the pit-in lane at 190mph and always makes me think of a catastrophe about to happen every time I see it. To be fair, I will give the course credit: they resurfaced the track, so it's no longer like driving on rumblestrips. Now it's almost smooth... for this race, at least. Next year? The track'll be crepe again. There's not much they can do about that, short of moving the circuit. The location of the darn thing, between two lakes set in a valley, means that it was built on very soft soil... so the concrete and asphalt actually sinks over time. Of course, it all doesn't sink at the same rate, so the track wrinkles. And places like Watkins Glen sit unused. How is this fair? Nothing surprising from practice today. Hamilton was fastest. The tire choices this week are the supersofts and the softs, and it looks like the supersofts will last about, oh, one lap or so before they start to grain and shed bits of themselves. Lovely. In other news, Alex "Man-Mountain" Wurz has officially retired, and has been replaced by Kaz Nakajima... and the Williams seems to have woken up big-time under his tender efforts. Late in the session, Kaz was fourth. He fell to 8th, finally, but still impressive for the team. Also, Phil Massa has been signed by the Peripatetic Pony team through 2010. This would seem to indicate that HWMNBN will NOT be going to the Red Team, since Kimi is also under contract. Renault is his probable destination. No chance of him coming back to McLaren. There was a board meeting at Mercedes (who owns 40% of McLaren) recently, and they voted to launch his arse as soon as the season is over. Amazingly, Ralf Schumacher IS driving this week. This surprises me, to be honest... he's not going to be back with Toyota next year, after all, and he's honestly stunk up the joint this season. Why NOT try someone else for a race? Maybe he's still waiting for the shift manager job at the Berlin McDonalds to open up? 1 Your concern is that people slowing down to go into the pit could get rear-ended? Yep, that's a lot of GPs! And, thankfully, Brazil is in a decent timezone*, so we can watch it without having to be hooked up to a coffee IV. For starters, practice is brought to us live at (ready for this?) 11am on Friday morning. I'll be dragging myself out of bed just in time, I think, but I'll be there! Saturday, it's the Brazillian quals (that's a lot of quals!) at 11am. Easily the single most important qual session this year, and... I won't be able to watch it, as the Duck U. football team takes to the field at home this Saturday, and that means the Bookstore will be open. Oh well, I'll catch it when I get home. Then comes the big one: the Brazillian Grand Prix, which will decide who wins the Driver's Championship. Sunday, SPEED's coverage will begin at 1030am. You know F1 UPDATE! will be there, camped out on the couch and watching every second. Anybody for rain? *European readers, your mileage may vary. 1 I'm in total agreement! YAY! Finally a GP that doesn't intrude on my beauty sleep. I'm really looking forward to this one--talk about drama! Steven, F1 is targeted at European viewers. The US, Canadian, and Brazillian GPs are either very late or very early for them... which means that the FIA wants as few of them as possible. ...and the USGP has been held at Riverside, Sebring, Watkins Glen (the classic home, where it should still be held, but that's just me), Long Beach, Las Vegas, Detroit, Dallas (once, in 1984), Phoenix, and Indy. And just to make it even more interesting, from 1950 to 1960, the Indianapolis 500 was a Grand Prix Championship Points race. Without a doubt, the Legendary Announce Team from SPEED is excellent at their jobs. They work together well, each member knows their stuff, and they are good on-air. It's hard to imagine a better group to take you through a F1 race. My friends, I am here to say that if I could, I'd turn my back on them in an instant. There is no better coverage than that given a race by ITV out of England. They spend more time on a race, they spend much more time on the pre-race, they don't clutter a screen with excess 'local' graphics, and while their on-air announce pair aren't quite as good as the LAT, they're pretty darn excellent. I could watch them all night... and pretty much have, this evening. SPEED is good, but they could learn a lot from ITV. Flotsky, you don't know how good you've got it. Over the course of this past season, I've come to dislike Fernando Alonso, forever to be known as "He Who Must Not Be Named" (or HWMNBN for short), intently. It's a shame, as I was becoming quite the fan of the boy... anybody who can beat Slappy Schumacher in head-to-head racing is someone that's okay in my book. There's no denying that he's a talented driver, however. He didn't win those consecutive Driver's Championships by accident, after all. However, his actions over the past year (and, for that matter, towards the end of last season) have done a fine job of turning me (and just about any F1 fan who doesn't hail from Spain, and probably some of them, too) against him. Which means that there's a huge element of Schadenfreude contained in the joy I take in reporting the results of today's qualifying session for the Grand Prix of China. The one thing that HWMNBN needed to have today, to have any reasonable chance of beating his 'teammate' in the Driver's Championship, was to be on pole. Considering that Typhoon Krosa is bearing down on the Chinese mainland, (it might cause some SERIOUS problems for the teams trying to leave after the race) the pole will be more important than ever for Sunday's race. HWMNBN didn't get pole. He didn't get on the first row. He's not even going to be on the clean side of the track. He qualified fourth, behind both Ferraris... and his 'teammate', Lewis Hamilton, who DID take pole. Kimi Raikkonen, hanging on in the DC chase by his fingernails, is alongside him on the first row, with Massa third. The big question now, of course, is fuel. Did Hamilton short-fill his tank to get the extra speed? Are the Ferraris heavy? Is HWMNBN heavy? Who's set up for the wet weather that's going to be present for the race? David Coulthard's Chin pulled a fantastic qualifying performance out of his RedBull, coming in 5th. There are a couple of reasons this might have occurred. The first that leaps to mind is that the team set him up for dry weather instead of wet. If so, he's certainly going to qual well, but will be in a world of hurt tomorrow. The second is that he's got no gas in the tank, which in the rain won't hurt as much as in the dry, but it's still not good. The third possibility is that the RedBull is, finally, coming alive. That his teammate Mark Webber is 7th puts some weight behind that possibility... though the other two would have the same effect as the third. We'll find out Sunday. In between the two RedBulls is... Ralf "Dead Man Driving" Schumacher. The Toyota probably had seven ounces of fuel in the tank. Surprisingly, the BMWs of Grizzly Nick Heidfeld and Robert Kubica were 8th and 9th. A horrible performance for them, which suggests a lot of fuel, perhaps a one-stop strategy in the wet. 10th was the 'resurgent' Honda of Jenson Button, who's gotta be praying for a lot of rain. All will be revealed Sunday... will Hamilton be the Champion afterwards, or will Brazil be the do-or-die race for HWMNBN and The Kimster? Will we get a winner from someone OTHER than McLaren or Ferrari? And can Dead Man Driving get on the podium? Can DC'sC show that he's still got some juice in his bones, in his best shot at a victory in a couple of years? And whither Canada? Post contains 673 words, total size 6 kb. McLaren confirmed that both drivers had qualified with similar fuel loads. While Hamilton subsequently smiled his way through a series of press conferences, Alonso's mood could be gauged by the manner in which he stalked back to the team's paddock HQ and kicked a door from its hinges. 2 My blockquote tag got removed. The center paragraph above is a quote from that link. The bottom line is me. ...this is just getting ridiculous. Lewis Hamilton is now under investigation by the FIA Stewards, allegedly for causing the accident that took out Mark Webber and Sebastian Vettel during the Grand Prix of Japan. Webber and Vettel both state that Hamilton was driving erratically behind the safety car, slowing down dramatically and the speeding up. Webber blames Hamilton completely: "I think he did a s*** job behind the safety car. He did a s*** job and that's it. He spoke in the driver's briefing about how good a job he was going to do and he did the opposite. But we know for next time. It definitely contributed to Sebastian (Vettel) hitting me up the back. We were confused what the other car was doing because it wasn't doing what it was supposed to do, clearly. You have to keep a sensible rhythm and obviously in the first safety car period and clearly in the second there was not a sensible rhythm." The accident was missed by Fuji TV, but a video has surfaced on YouTube, showing Hamilton coming close to passing the SC by sliding wide, then decellerating to keep behind it. Webber then nearly passes Hamilton, slows down, and Vettel rams into him. If the Stewards decide that he's at fault, he could be penalized 10 places on the grid... or he could be stripped of his win at Japan, and docked the 10 points he earned. Is it any surprise at all that Fernando Alonso, his so-called teammate, has chimed in? "I also overtook Lewis two or three times (during the 19 laps run behind the safety car at the beginning of the race - WD), so it seems that we all agree. It's difficult to know what the car in front of you needs to do. I didn't see the race on TV but, hearing the comments of the drivers, they seemed to overtake the car in front a couple of times and had to make some unnecessary manoeuvres to avoid the cars in front." Need I mention that if Hamilton is stripped of his points, the Driver's Championship is down to 2 points again? And that Alonso is the beneficiary? Need I mention that F1 needs this like it needs a hole in the head? 1 Someone ought to make book on whether or not Hamilton and Alonso endup in a fist-fight before the end of the season. If I were Hamilton right now, I'd be sticking pins in an Alonso doll. 3 Someone's been needing to stick pins in Alonso... (ahem... errr... I mean his doll)... for years now. 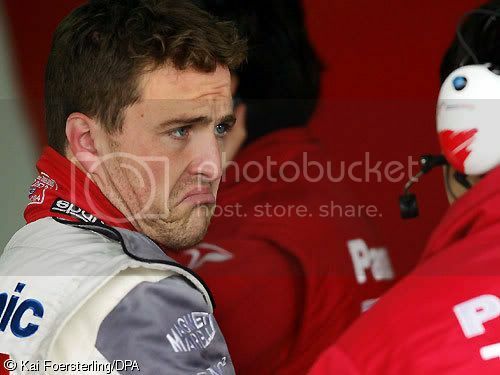 At least JPM left Alonso as the sole wearer of the mantle of "Cheif Whiney Git" when he moved to NASCAR. Listening to him is getting old. 4 And it looks like the video's been disappeared already. 5 I'm not saying that he should be docked, but I was making a comment about Hamilton's erratic speed control at about lap 5. It almost looked to me like he was trying to force Alonso to pass or hit him. I will say that if he had been hit I wouldn't have felt sorry for him, nor do I think the hitter should have been punished. Was not the 5 car lengths rule implemented after the incident with M Schumi in the tunnel at Monaco a few years back? Buttons, I think the rule has been on the books for a lot longer than that, but Slappy's incident (his own darn fault, by the way) brought attention to the fact that it had been largely ignored. I'm not entirely sure I agree with you regarding Hamilton's oscillating speed behind the SC being to cause HWMNBN to hit/pass him. I seriously believe that he was trying to keep some small amount of heat in his brakes/tires on a track that really wasn't driveable at that time. The weather was, to be blunt, extraordinarily bad. With the stunning, devastating news that Ralf Schumacher won't be driving with Toyota in 2008 ringing in our ears, somehow we must carry on with our lives. For it will be good for all readers of The Pond to resume our daily activities, though with a heavy heart and tears in our eyes. And, if at times during our day, we find ourselves feeling we can't go on, that F1 no longer is worth watching and life is no longer worth living, remember that he would not want us to mourn for long. Instead, he would have us continue to love the sport that taught us so much about him... so lets do so, together. Ralf would have wanted it that way. Friday at 1am, SPEED Channel brings us LIVE coverage of P2. Much later in the day, from 1159pm 'til 1am, we get F1 Debrief, SPEED's recap show... which will be covering, of course, the Japanese Grand Prix. That'll be must-see TV, for sure! Saturday, from 1am to 230a, we get live coverage of Quals. Sunday brings us the penultimate race of the season, LIVE, from 1230a to 3am, with a replay from 330p to 6p. Now you've got no excuse... watch, won't you? I saw that the system was giving you errors when you tried to create a new banner. Can I help? 2 Pixy, I'm trying to increase the banner width by 50 pixels... you can see what's happening, probably. I've uploaded a longer version of the banner, but the system keeps spitting back at me. 3 In case you're wondering, I've adjusted the column width to 800pixels, by the way. 4 If you edit the starter banner and only change the width, do you get that error? I've changed the banner to "blueduckcopy", which is 800px long, but it's not showing above. 6 Okay, when I tell the blog to change the image width to "other, 800px", it keeps resetting itself to 750px when I click save... does that make sense to you? 7 As long as it shows up as 800 in the box, it's fine. I'll fix that though. I just tried it on the test system and it worked perfectly. Can I take control of the blog for a minute to test things? 8 Okay, I snuck in and snuck out. I'm not sure what triggered that memory error you got; I couldn't replicate it on the test system. Your new banner works fine. You just need to go back to the style and tell it to use that one. Kind of confusing, but easy once you know how. Which is why I'm off to finish up the theme builder documentation right now. 9 Oh, and I'm about to add a sidebar colour option and fix the page colour so that it actually changes the colour of the page. So your blog might briefly turn grey, but then you can change it back again. 12 I'm sure that, in coming years, Formula 1 will continue to find a place for the third best driver, perhaps sweeping clutch fragments from the pitlane with a biodynamically-made broom, certainly dispensing kindly advice to the up-and-coming ride-buyer. "Backstage" Schumacher will long have a home in the sport. Pixy, as usual, you're the ginchiest! Steven, you're not going to believe this, but I can't even guess what those four posts ARE. Back in the control panel, it shows blanks for both name and path, and no way to access them! 14 It could have been a hiccup caused by something odd in the export file. In fact, that's probably what it was. I used the MT export instead of my custom one which escapes the end-of-post markers if it sees them inside a post. You can just delete the "blank" category; that will fix the categories list at least. Such sad news about Ralf. Maybe he'll come to the States to join the growing number of open wheel drivers headed to NASCAR. It sort of looks like Ralf is talking to a sock puppet. Heehee. The ear phones on the person next to him look like a blue eye and lots of lipstick. 17 Whatever you do, don't delete those four posts. They're the only things standing between the world we know, and eternal damnation. 68kb generated in CPU 0.09, elapsed 0.2443 seconds. 53 queries taking 0.1773 seconds, 286 records returned.